Having 4 littles in the house brings many busy days! My 5 yr old has been practicing shoe tying as a quiet activity latley. 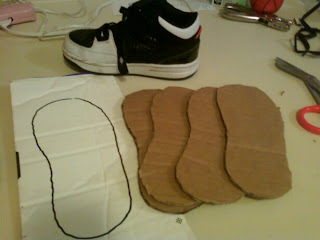 I didn't like the fact of using his dirty outside shoe to practice , so I did some searching and came up with an idea. 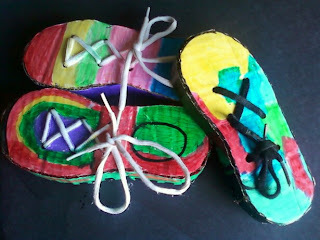 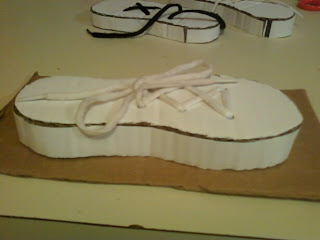 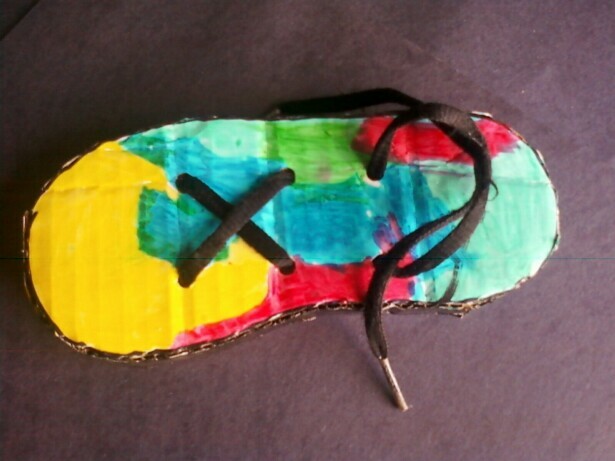 I have seen many people make their own cardboard cutout of a shoe and then lace it and have their children practice. 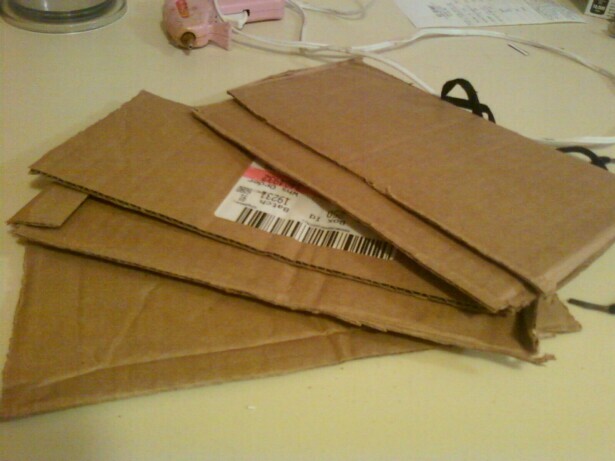 I chose 5 pieces of sturdy cardboard, mine was from a diaper box. I used the end flap which happened to be white for what I used for the top piece. 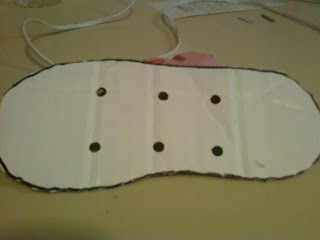 Hot glue all of the pieces together except the white piece. 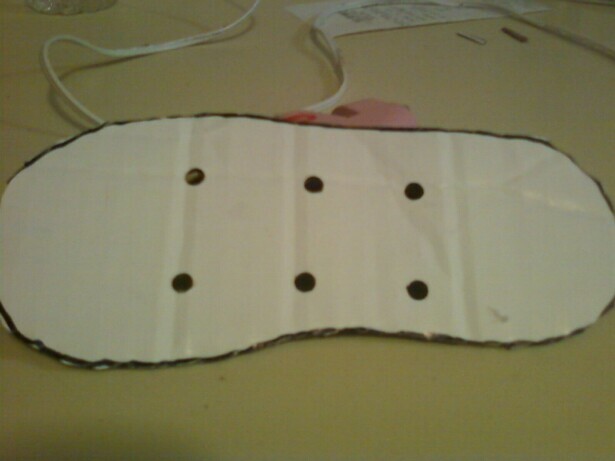 Next, you will need to punch holes in the white piece where you plan on lacing your shoelace for the tying practice. 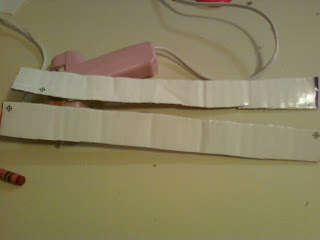 Lace the top piece then hot glue it to the other 4 pieces, make sure you don't glue the end strings! 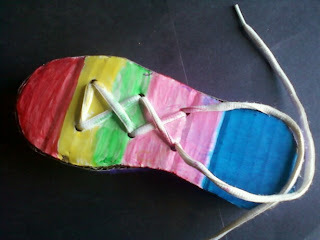 To make your shoe more fun, you can use fun colored shoelaces. 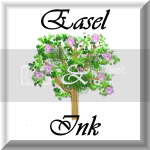 There are so many varieties out there. We chose to use what we already had. 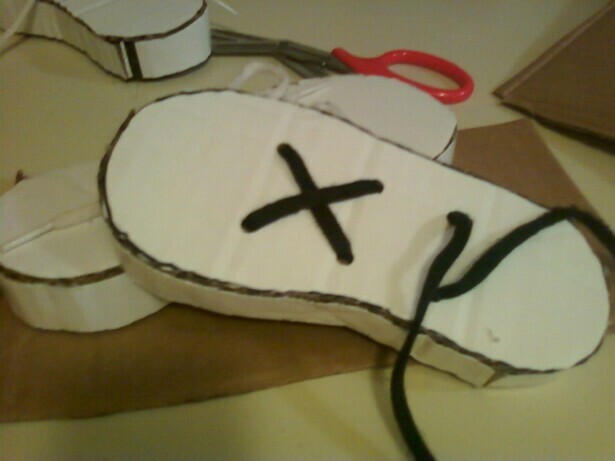 You don't have to do this last step, but I did to make the shoe look more finished. 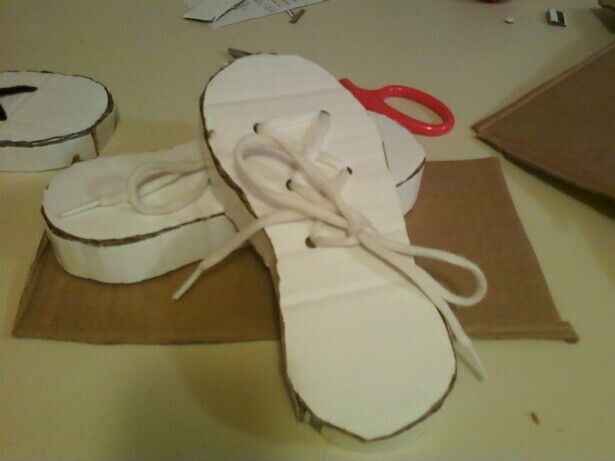 Cut one or two white strips the width of the sides of your shoe and hot glue around the sides of the shoe. 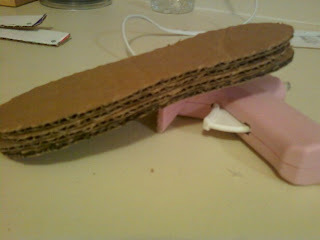 This is what the sides will look like once the strips are completely glued. Your ready to start decorating your shoe now! 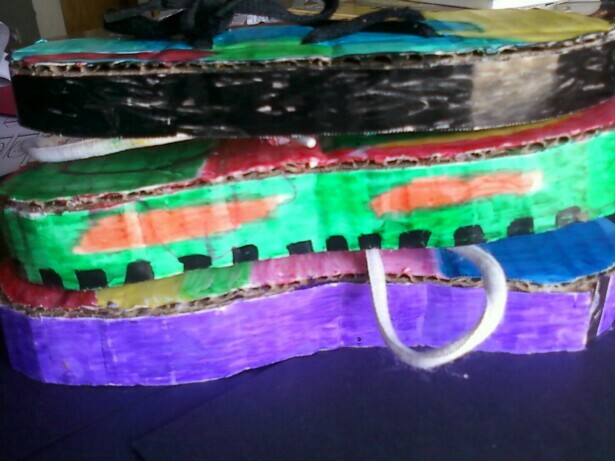 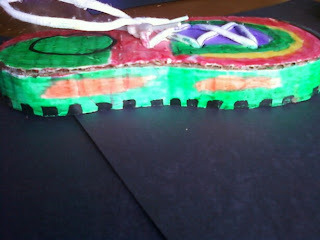 Here are what our shoes looked like once the kids colored them. 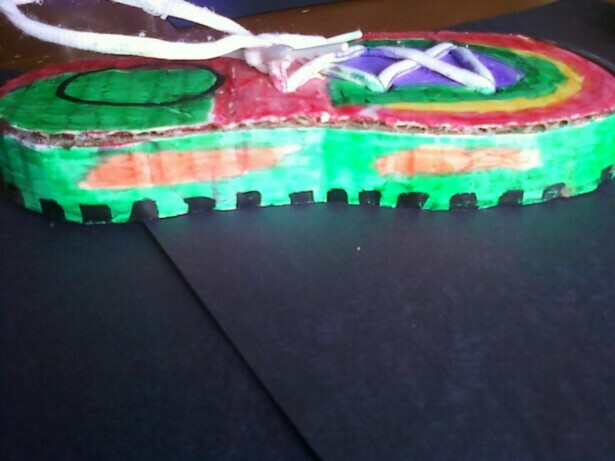 We chose to color with markers, but you can either paint,color,glitter,glue nice beads or anything you can think of to make your shoe stand out and be appealing. 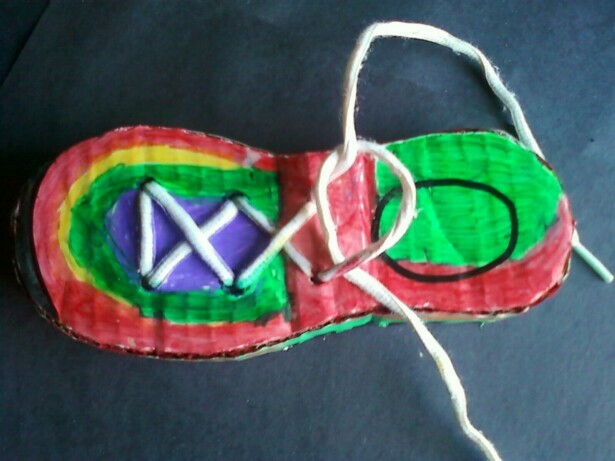 I think this is such a great alternative for learning how to tie your shoes. Go ahead, try it!